The history of the lives of Dr. Fred Inglis, and his friend James (J.S.) Woodsworth gives insight into the social and political atmosphere on the Sunshine Coast in the early 20th century. 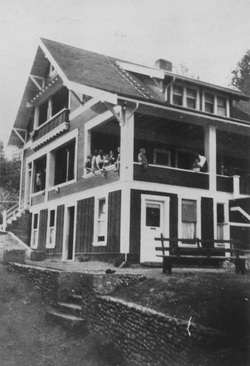 Upon arrival in 1913, Inglis built his home in Gibson’s Landing, naming it Stonehurst. As the sole medical practitioner on the Sunshine Coast until the opening of the hospital in Garden Bay in 1930, Inglis diligently served the community from Langdale to Halfmoon Bay by horse, bicycle and eventually by motorcycle and by car. His home was also a clinic and pharmacy, making it a cornerstone of the community for decades. Inglis took an active hand in local politics and projects. He was a member of the Gibsons Co-op Store, the Gibsons Village Council, and he took part in school board meetings. Inglis befriended Woodsworth, a Methodist Minister who arrived in Gibson’s Landing in 1917. They shared a deep interest in socialist ideology and where both strong supporters of pacifism. Woodsworth attended meetings at Stonehurst, and resigned from the church in 1918, when he determined that his political views could not align with the church’s support of involvement in World War 1. This was without a doubt an immensely difficult decision, as up until that point, the church had provided himself and his family with support and accommodation. Upon his resignation, Woodsworth, his wife Lucy, and their six children moved into Stonehurst with the Inglis family. He began work on the docks as a longshoreman, an experience which gave him first hand insight into the rampant worker degradation of the times, which in turn solidified his views on egalitarianism and worker solidarity. In 1919, Woodsworth went on a lecture tour that culminated in him addressing 10,000 workers during the famous Winnipeg Strike. Back at Stonehurst, Lucy feared the worst after he was jailed for his involvement, but the charges were subsequently dropped. Woodsworth then moved to Winnipeg with his family, and later became one of the founders and leaders of the Co-operative Commonwealth Federation (CCF) in 1932, making him a pioneer in the Canadian social democratic movement. the two families along with original interior furnishings and household items from Stonehurst, including furniture constructed by Dr. Inglis, and Woodsworth’s cherry wood bedroom suite that was brought from Brandon, Manitoba and was in the family from 1885 to 2002. Stonehurst has recently been restored, and now functions as a heritage bed & breakfast that has now reached its 100th year anniversary.